I'll check it out on the way home. Good for my moonshine business. These are brilliant for keeping stuff in. Link takes you to the Sainsbury's website, when searching on Kilner Clip there are only 2 items, both 1.5l and £4 each so presumably this is in store only. I got 3 of these about a month back, I'm sure mine were bigger, either £6 or £8 originally - brill buy! Tk Maxx also do triple packs of large ones for£7.99 for those with no Sainsburys near! £4 in Heaton Park Manchester. cold - Ikea sell these for under a £1 and they are very well made. Also different sizes available. Link takes you to the Sainsbury's website, when searching on Kilner Clip … Link takes you to the Sainsbury's website, when searching on Kilner Clip there are only 2 items, both 1.5l and £4 each so presumably this is in store only. If you search with just 'Kilner' the 2L jar is the first of three results (strangely doesn't show the 1.5L jar). But I'm out of stuff. Anyone know any deals on stuff? Thanks for stating the obvious... I really needed to know that! I need more stuff to store all the stuff I keep accumulating. 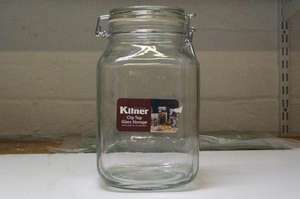 Are these proper kilner jars that can be used for canning? Are these airtight? I need to store ground coffee. Are these airtight? I need to store ground coffee.Thanks. I would say yes, the rubber seal ring is a good indication! I just pickled 30 odd eggs, my house reeks. it's soon gonna be jam making time again! cold - Ikea sell these for under a £1 and they are very well made. Also … cold - Ikea sell these for under a £1 and they are very well made. Also different sizes available. if youre gonna make comments like that at least get it right! must say this is a great little jar....to put STUFF in !!!! Yes and the ikea jars are not vacuum sealed (at least not the ones I had) so are useless for pickling things. [quote=] Are these airtight? I need to store ground coffee.Thanks. What was odd about them, the shape? Yep, and the fact they were free range and organic. WoolyM: Everybody should have a jar of pickled eggs in a Kilner jar for decoration. .... When I have been to Ikea the past 2 times to get these jars for my wedding sweetie table they haven't had any!! just thought I'd let you know!!! Better try Sainsburys tomorrow!! Less than 3 weeks to go!!! EEEKKK! Deal posting newbie! This is mrharrison1 first deal post. Help out by leaving a posting tip or just to show your appreciation for their contribution.